5.45 points at 20 votes (rank 724). During an archaeological expedition (the search for the Sankara Stones) in India, Indy comes across the isolated town of the Mayapore. This stone protected the inhabitants and since it was stolen the town headed downhill and additionally children were missing again and again. Indy discovers that the Stone was stolen by Mole Ram, the unscrupulous high priest of the Maharaja, and also the children were captured and enslaved by him, to dig for the other three Sankara Stones in the mines. 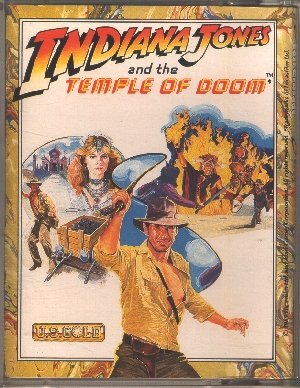 Indiana Jones and the Temple of Doom (Dir. : Steven Spielberg, Screenplay (story): George Lucas) was at first produced for the arcade machine with the same name and later for the C64 and other platforms. The game mainly consists of three parts (levels), whereof the first part can be categorized as a classical platfomer. 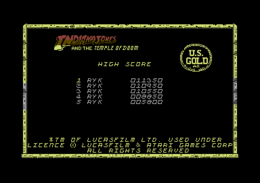 The plot in the game deviates sharply from the movie, only part 2 (the ride in the lorry) and the bonus level (rope bridge), are derived from it. The gameplay is child-friendly, the human opponents do not die but only get unconscious, even if they fall down a cliff. The graphics are acceptable, the small animations in the game like to please. Against the arcade machine, the graphics pale heavily, especially in the lorry ride. 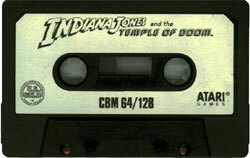 However, the background music, a modification of the Indiana Jones theme, heavily bugs one after a few minutes. A highscore list is available, but is unfortunately not saved. In the labyrinth you need to search for the lorry. On the way there you should release the children from the cells (bonus points). If you are standing near a cell, you can open it with the whip (fire button). On the way to the lorry, you need to surmount platforms. Between the platforms can be conveyor belts that move the player to the left or right. If you do not jump on a ladder at the right time (partially you can also jump a level lower), you will be squashed by a roll. On the platforms are snakes and guards. When getting in contact with them you will lose a life. The snake disappears when you hit it with the whip, but the guard gets only unconscious for a short time. Over an abyss between the platforms you can also swing with the whip, if there is a peg in the wall between the platforms. When you have reached the lorry, the level is solved. The aim of this level is, to reach the end of the track without an accident or crash with the followers. In this game you need to remember the course of the track and the damaged spots on the tracks, e.g. you need to know exactly where you have to steer to at what switch point, because an utterly bothersome follower is close on your heels, who can throw you from the tracks either by a crash or with a lash of the whip, which results in losing a life. / = to steer to the left/right at switch points; damaged tracks; right track - steer to the left and vice versa. Open the door with the help of the hidden mechanism. For this you need to do the following steps: go to the left or right, kill the snake, go diagonally forwards to the wall, turn into the direction of the abysse, swing over the abysse with the whip, go to the idol head in the middle and strike it with the whip (this needs to be done fast, the bridge opens and closes), finally slip into the opening door. Of course you must not get caught by the guards and fire balls and falling into the abyss is of course also deadly, it's that simple. Level 1 and 2 repeat after the third level with altered placement of the platforms. In the third level a different door opens. 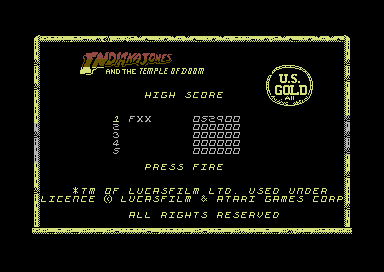 This sequence (levels 1-2-3) is repeated three times, then you can walk over a short distance over the rope bridge as a bonus game (also a scene from the movie) while fire balls are fired on Indy. If you survive also this part of the game, the whole course starts anew. At first you should turn to the right and release all children one after the other. If only four children are still imprisoned, you go to the upper left, release the last children and reach the entrance to the lorry. H.T.W: "This C64 conversion of a game, which is already not very exciting on the machines, is a thorough fail. While in the original at least the graphics were good and the digitalized sounds were great, you have in this version a lovelessly drawn background and a for a C64 unworthy background music. If you imagine, that at that time the top game Nebulus was released, one can figure that there were many pulled faces amongst the Indy fans (among which I also number myself) when this "creation" was put in front of them...". 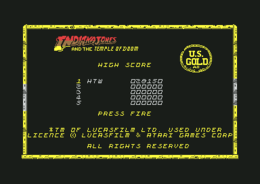 TheRyk: "Unfortunately, any real traces of an interesting gameplay are ruined by spooky controls, unfair situations, some amateurlike coding (just look at the colors in the highscore screen) and a totally enervating of the Indiana Jones theme as background music. On top of that, the loading times are just annoyingly laaame. What a bummer! With some more love this could have been a much better game. As a commercial software release in 1987 this game is a big disappointment: 3 points. FXXS: "Can only be recommended, if you really want to whip out peple endlessly (or chastise yourselve). Each blow raises the highscore. 5 points." 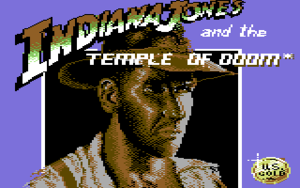 Indiana Jones And The Temple Of Doom in the Killer List Of Videogames. This page was last modified on 2 May 2015, at 23:19.